During our school days, boys and girls used to be separated in classrooms where the first two rows were occupied by boys and the last two, by girls. Though the situation has changed considerably from then, it does exist and seems to be strengthening day by day all over again. Strangely amusing was the idea of punishment: if a boy was caught when he was up to some mischief, he was forced to sit with a girl partner, and vice versa, that would leave them feeling humiliated. I wouldn’t blame the kids; it was the school’s responsibility of ingraining a sense of discomfort in their minds that boys and girls shouldn’t and cannot mingle. This, I believe, was where the inception of awkward social skills took place. I remember attending pre-picnic meetings every year to discuss the timings, venue, safety and precautions that had to be adhered to. After covering all the important inputs, boys were asked to leave the class by the teachers, while the girls were not. Those days, I never understood why they did that. Since I was shy when I was in school, I felt that living in my fairy-tale world would be better than finding out what this mysterious situation was all about (yes, I do believe in fairy tales and angels and such and yes, I am also male). Girls would often take leave from school and later in college for even two to five days at a stretch and when asked why they were away, they would get away by either saying they were ”not well” or ”had to go out”. Believe me, I was still perplexed. 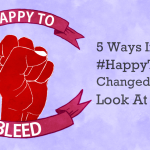 After many years, I have come to realize that the reason for all this was of course, menstruation. I then, read a lot about menstruation and learnt that it was a monthly discharge of blood and mucous tissue from the inner lining of the uterus that was meant for aiding pregnancy in women. I didn’t find it strange at all, yet I wasn’t able to fathom why it was kept a secret for so long! Soon, I surfed the Internet and was shocked to read about the myths and taboos around it and how women were forced to restrict themselves with rules that had no rational logic behind them in the first place. It was so taboo a topic that even my mother and my aunties had kept mum all along! 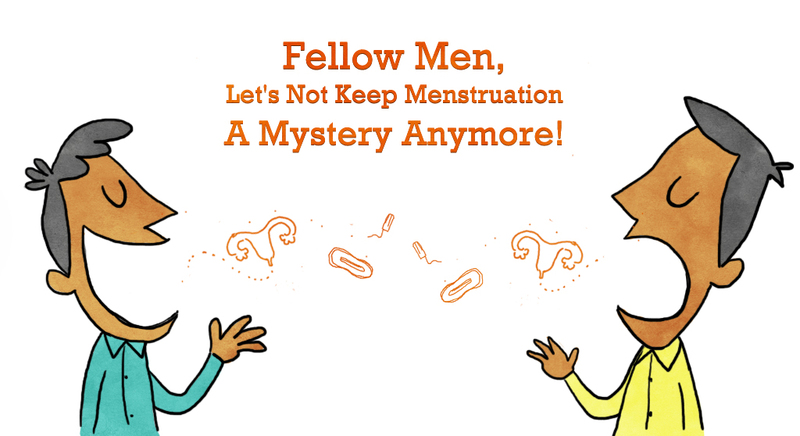 Girls are made to believe that speaking about periods to people, and especially to boys, is unethical. These excuses were their code-speak since the impression had been created that boys would make fun of it because they wouldn’t understand and needless to say, this seed of ignorance leads to the manifestations of many a myth in the minds of women (and men, alike). I recall incidents where boys would gossip about it, they would tease the girls and literally discourage girls from openly purchasing pads at the chemist’s. This sensitive issue was addressed in the most hideous manner. Even till this date, we are not allowed to read about it, openly speak about it and most importantly, we never get properly educated about it. If apprehension over such an important issue continues, how can we prepare our kids to understand their own bodies in the future? Why scare the daylights off of a girl’s impressionable mind concerning periods, when she is supposed to be made comfortable and accepting of it? The more stressed out she is, the more affected she will be physically, because psychology always affects physiology. We have now entered the 21st Century and have accomplished a mission as impossible as capturing a live image of the planet Pluto, but we are still chained by societal beliefs that have held strong since ages. Thankfully, it is now revolutionizing. Girls are getting into the comfort zone of talking about periods and I find it empowering to see some of my female friends visit temples even when they are menstruating and yes, they go ahead and touch pickles. Many are no longer reigned in or curbed because of it. 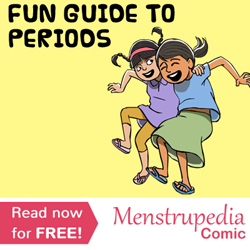 If you ask me about menstruation, I would say that it is a very normal biological process that nearly all women go through. It is an incredibly tiring phase for a woman and a pain inducing experience where understandably, she is prone to having various mood-swings. In that case, we need to give her space and let her relax within a comfortable ecosystem. Treat her like a queen! If she feels like cooking some food and serving instead, give her the privilege to do so. If she wants to visit a temple, she should because it’s really funny and strangely unacceptable that we worship a menstruating goddess on a daily basis but prohibit a menstruating woman to pay her respects to her. Last but not the least, shed the shame and purchase sanitary napkins, tampons or menstrual cups for your beloved women and girls. Also, educate yourself and others about it. Nived is a Biotech graduate working as researcher for an architect firm. He aspires to be a writer and editor in the world of entertainment. This Mother Gives The Best First Period Talk Ever, On Television!